With all the Orwellian quotes from 1984 being tossed around as a result of PRISM, I thought I’d use one from his other book to describe the paradox of customer service for those of us who have ever supported a large and diverse B2B customer base. How do you provide a *great* experience for all of your customers in a scalable manner while creating something truly exceptional for your high value customers? 3) Realize that the growing customer base is now large enough that it needs to be proactively managed and scramble like crazy to get the recurring revenue base under control. If you’re at this stage, getting things under control and categorized can actually be pretty straightforward. It just takes some thought, focus, and basic analysis. I’ve blogged about some of the technologies that are emerging in the space of revenue renewal management or Customer Success Automation. The reality, though, is that most SaaS companies, especially early stage ones, don’t yet have an analytics or Customer Success Automation solution to provide them with good insight into their customer base using real data-driven scoring and early warning systems across all customers. This post focuses on how to segment customers in the short term using basic data that you already have on your existing customer base (MRR, ACV, CLV, plus some other identifier for “strategic” accounts) …and it starts with the 80/20 rule. While it may not be exactly 80/20, the reality is that in the vast majority of B2B SaaS companies, some small percentage of customers will represent a very large percentage of their revenue. Those customers are very high value and need to be treated as such. Create executive relationships and multiple touch points. Invest in them. Meet them face to face. Get to know them. Involve them in your business. Provide detailed monthly or quarterly business reviews that give them an indication of progress against stated objectives that you’ve worked out with them in advance. Determine the set of services you should be providing to this tier of customer and identify the amount of time it will take on an ongoing basis for your CSMs to provide those services to a model customer, then understand how many customers you can reasonably and consistently service given that time requirement… Congratulations, the laws of time and space just helped you create your first cut at your top customer segment. Until you add more trained, senior, CSMs to your team or modify the level of service, you shouldn’t try to service more customers than you can at this level. If you over-commit, you risk missing on delivery expectations and you’ll leave your customers, er, less than satisfied. That may sound obvious, but getting from today’s reality to tomorrow’s desired state needs to be carefully managed. Next, determine how many customers you would like to see getting that level of service and either staff up your CSM team or pare back your service offering slightly (or some combination of both) in order for your needs and reality to align. Whatever number you come up with, you will need to justify it financially and take it into consideration when calculating your cost of services. A good initial target to shoot for if you’re a B2B SaaS company is to get 40% of your revenue into this bucket. In many cases it will be represented by fewer than 10% of your customers. Your mileage may vary, of course; however a reasonable range seems to be 1/3 to 1/2 of revenues represented by this customer tier for B2B SaaS companies. While a high touch model works for that small percentage of customers who represent between 1/3 to 1/2 of your revenue, the law of diminishing returns takes over quickly and that model won’t scale to service the rest of your customer base. In this next tier, each CSM will handle significantly more customers (sometimes up to 10x more) than their “Top Tier” counterparts and they will need automation in order to be effective. Try to identify useful data that you can extract from your systems, and automate its delivery to your customers via Customer Marketing and drip campaigns that are “signed” by the CSM. Compare that customer’s data against relevant benchmarks or aggregate data from the rest of your customer base. The more you can automate the heavy lifting and position your CSM as the expert who can provide some context, insight, and recommendations around the data presented, the more you’ll position your Customer Success Managers for success. Some percentage of customers, (in many companies this group might represent the majority of them) are not going to generate revenue sufficient enough to justify the cost of a high-touch relationship – especially with respect to proactive communication with customers. In order to support this tier of customers, a company needs to build out great self-service tools, including a self-service portal and an excellent customer marketing program… and they need to have a product offering for this tier that is intuitive and continuously improved as a result of customer feedback. Companies like MailChimp and ZenDesk are poster children in this space for what to do and how to do it. They provide great content. They also understand that many of their existing customers interact with their company primarily online, so they focus on creating a powerful, bonding, consistent online experience for their customers. Philosophically, they don’t see a “low touch” model as “low service”. They see it as a way to create a consistent, powerful, engaged relationship with their customer base – at scale. Understanding the importance of getting the product experience right, they also constantly listen to customer input, concerns, and challenges and respond by continuously making their product easier to use, more prescriptive, and less support-intensive. 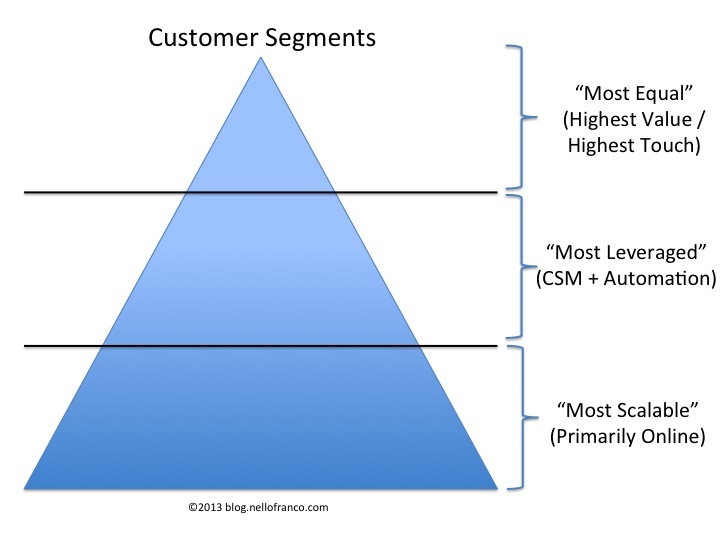 While every company’s distribution of customers across these segments will vary with respect to percentage and number, and while your specific circumstances might require one more (or fewer) segment; understanding and segmenting your customers will help you focus on taking the right steps to provide the right level of service to each of them and create a great experience across all of them. How have you segmented your customer base and what challenges have you faced in the process? ← What do YOU want people to feel?